The melting and freezing of sea ice moderates ocean temperatures, as discussed in the preceding section. In addition, this affects the salinity budget in polar seas, with ramifications for ocean circulation and formation of water masses. Sea-ice formation results in brine expulsion and the creation of dense, saline bottom waters. For the near-freezing temperatures of the polar ocean, density is primarily governed by salinity. Katabatically maintained polynya adjacent to the Antarctic coast are "sea-ice factories" associated with large rates of bottom-water production. This is particularly effective in wide parts of the Antarctic continental shelf in the Weddell Sea, where brine expulsion leads to formation of high-salinity shelf water. This mixes with the highly saline circumpolar deep water that sits just off of the shelf to create Antarctic bottom water, which floods much of the world's deep ocean abyss. Circulation and melting beneath ice shelves probably play some role in this, as ice shelf meltwater can be exceptionally cold, and it mixes with high-salinity shelf water to contribute to the deep water mass outflow from Antarctica. In the Arctic Ocean, sea-ice formation has a similar effect, but saline deep waters are largely confined to the Arctic basin. However, sea-ice formation in the Labrador Sea and the Scandinavian seas contributes to intermediate and deep-water formation in the North Atlantic. Sea-ice melting has the opposite effect, freshening surface waters where it melts. In the Arctic, this combines with high quantities of spring and summer river runoff to contribute to strong stratification of surface waters; surface waters in the Arctic are the freshest of any of the world's oceans. Glacial meltwater also contributes to this freshening, in particular runoff from the Greenland ice sheet. Annual meltwater discharge from Greenland is similar in magnitude to the major Arctic river basins that drain Canada and Russia, ca. 350 km3 w.e. yr-1, with most of this concentrated in the summer months. Where water masses and sea ice advect out of the Arctic basin, through Fram Strait and the canadian Arctic Archipelago, this represents a significant freshwater export, which can also tilt the salinity budget of the North Atlantic. Major freshwater advection events have been observed in the past, such as the "Great Salinity Anomaly" that began in the late 1960s. Strong ice export through Fram Strait in 1967 was identified as a pool of freshwater in southeast Greenland in 1968, which was then transported in the subpolar gyre into the Labrador Sea. It stalled there until 1972, before getting caught up in the North Atlantic Drift and advecting back into the northeastern Atlantic. The low-density surface water anomaly could be tracked until 1982. This was a long-lived feature that disrupted convective mixing and intermediate water formation in the Labrador Sea, creating cooler than usual sea-surface temperatures. This event was strong but does not appear to have been unique; several multiyear low- and high-salinity anomalies have been tracked in the North Atlantic region, linked with variations in freshwater export from the Arctic. Icebergs that issue from the polar ice sheets, ice caps, and coastal tidewater glaciers cool and freshen the waters in which they melt. Icebergs can have keels that are hundreds of meters deep, and melting at depth gives freshwater plumes that promote mixing and ventilation. Algal blooms have been observed as a result of the nutrient delivery that accompanies this. In tidewater fjords and estuaries, most icebergs ground and melt locally, helping to stratify surface waters and strengthen the estuarine circulation. In embayments with shallow sills there is limited mixing with offshore waters, so strong stratification associated with freshwater runoff and iceberg melt can lead to isolation of a basin, suppressed ventilation, and anoxia at depth. During the Pleistocene glaciations, large quantities of icebergs coming off of the North American and Eurasian ice sheets created a freshwater perturbation that was sufficient to disrupt intermittently the overturning circulation in the North Atlantic. Episodic iceberg fluxes from Hudson Strait, known as Heinrich events, flooded the North Atlantic region several times during the last glacial cycle, creating a stable cap of cold, fresh surface waters that helped to maintain the icebergs and enabled them to advect all the way from the Labrador Sea to the coast of Portugal. These events had worldwide climate effects, telegraphed through both the atmosphere and through disruptions of the North Atlantic deep-water formation. Meltwater runoff from the Pleistocene ice sheets and from catastrophic drainage of massive glacier-dammed lakes created similar disruptions to ocean stratification and circulation during the glacial period and in the early stages of deglaciation (8200 years ago). In today's interglacial world, the tables appear to be turned, and the oceans have begun to perturb the polar ice sheets. Marine-based outlet glaciers and ice shelves in Greenland and Antarctica melt and calve off at the ice-ocean interface, with ablation at this interface exceptionally sensitive to ocean temperatures. This also occurs in many of the smaller ice caps in the Arctic, where ice extends to the sea. Ocean warming or wind-driven changes in ocean circulation that bring warm water masses (e.g. circumpolar deep water or North Atlantic water) in contact with the ice can trigger destabilization of ice shelves and marine-based outlets. This propagates inland through thinning, grounding-line retreat, and accelerated ice flow, in a classically known "tidewater glacier" instability. Although the process is well understood for tidewater outlet glaciers in places like Alaska, it is not known how long it can continue and how dramatic it will prove to be for major marine-based sectors of the polar ice sheets. Rapid, ongoing changes in the Amundsen Sea sector of West Antarctica and Jakobshavn Isbrae in Greenland in the 2000s are linked with advection of warm-water anomalies to each region. Hemisphere. Greater energy is available for melting ice sheets at low latitudes, and the glaciated area contributing to runoff was large compared with that of today. The quantity of meltwater that characterized the glacial period is not conceivable from the Greenland and Antarctic ice sheets. Under most climate warming scenarios for the coming centuries, the freshwater fluxes associated with increased midlatitude precipitation, Arctic export, and changes in sea ice are greater in magnitude. Dynamical destabilization of a major sector of the Greenland or Antarctic ice sheet could provide an exception to this. 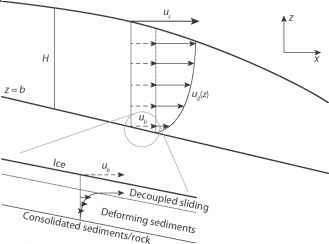 Ice sheet processes that could deliver large freshwater fluxes to the ocean include mechanical disintegration, as observed in the Larsen Ice Shelf, or a major surge event, similar to what must have occurred during Heinrich events.